If you search our database under accession number 34984 you will be greeted by a cascade of Swedish. This is not how we would like it to be but at the moment we are restricted by the confines of our database. Eventually it will be possible to conduct a search in English of the following parameters: Key word, type, material, part For various technical reasons it will take a while for us to import the English translations of these terms into the database. In the meantime we post here translations of terms so far used for these four parameters in the registration of the finds from the Alvastra pile dwelling. The key word is used to answer the question “What kind of object” in very broad terms. There can be several different types of the objects denoted by key words. Type is thus a narrower term. Other words for these two parameters could perhaps be type (Swedish sakord) and subtype (Swedish type). Much of the osteological assemblage has already been registered under the accession number 34984. Here the keyword is bone and the type is the species of animal the bone belonged to. 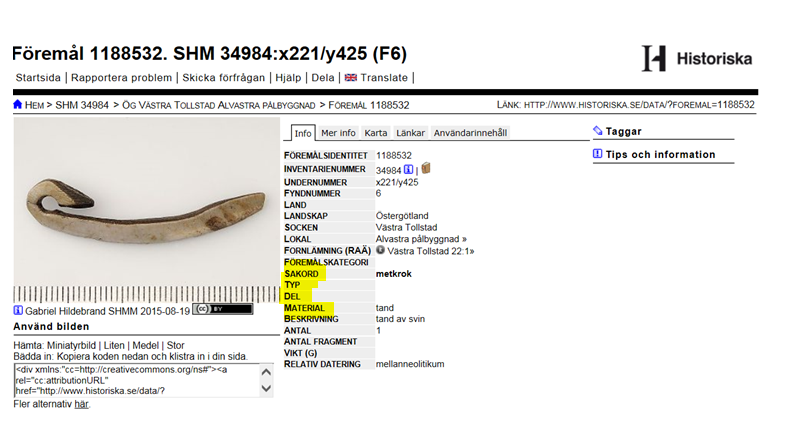 Registration of one artifact in the database with the translated terms highlighted. Some of these parameters are the same for all the objects registered. These are translated in the third column of the table.